2019 is here and if you’re looking for games like Fortnite, you’re in the right place. 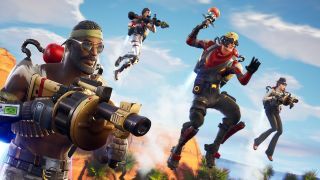 With the Battle Royale genre in its golden age, there’s constantly games from indie devs and AAA publishers all scrambling to get in on the last-man-standing formula, so picking the right one for you can be difficult if you’re looking for games like Fortnite that are a bit different from Epic’s title. To save you some time - and hopefully money too - we’ve gathered up all the Battle Royale games that you should give a go if you’ve had enough of Fortnite's Tilted Towers and Durr Burger. So get reading! Before Fortnite came along PlayerUnknown’s Battlegrounds, aka PUBG, was the king of the Battle Royale genre. It has the same 100 v 1 gameplay, but it’s much more serious, realistic and macho than Fortnite, more akin to something like Call of Duty. PUBG does feature two maps to play on though - Erangel and Miramar - both of which are much larger than the Fortnite map, to the point you actually need to use vehicles to get around and stay alive. The only slightly disappointing thing is that, as of yet, there’s no PUBG PS4 release date, so PlayStation owners are going to have to look elsewhere for their continued Battle Royale fix. What's great about Ring of Elysium is that it has the seriousness, and FPS quality that you're going to find in PUBG, but with a touch of the silliness of Fortnite. Real cat in a bubble-windowed carry backpack anyone? Yes, all of us. Not only does it have a seriously amazing character creation engine (seriously, I could tweak those dials all day), but it's also an incredibly solid battle royale game, that'll have you running from the ash storm on your BMX across the brand new Europa map. We're already obsessed, and so should you be. A bit like both Fortnite and PUBG, H1Z1 actually started life as a very different game. Originally, it was a zombie survival shooter, but since the whole Battle Royale craze blew up, it’s also decided to follow suit. This version started out as a King of the Hill mode, where up to 150 players scuffle to stay alive, with matches playing out much quicker and more chaotic than Fortnite’s versions. However, now the developer, Daybreak Games, has launched the free to play H1Z1 Battle Royale (complete with Auto Royale mode) on PC, with a PS4 beta launching May 22. It plays out like a game that sits comfortably at the point between the colourful silliness of Fortnite, and the serious FPS-ness of PUBG. The Auto Royale mode is an added perk too, as it pits 30 teams of four players against each other, with one player handling the vehicle while the others deal with the firepower. The driver also has to pick up power-ups and smash gear crates as they drive. It’s basically Mad Max Battle Royale, and it’s amazing. Hilariously Shattered Skies, the developer behind the game, call Last Man Standing the “ultimate survival looter shooter”, but it’s really just another Battle Royale game, although I tip my hat to their rhyming description. As the name suggests, the aim of the game is still to be the last man (or woman) standing at the end of the match. Interestingly, it’s one of the only Battle Royale games to strip out the building mechanics, leaving you to rely on the in-game surroundings for cover and protection. The weapon variety and attachments make up for the lack of building though, and the fact it’s free-to-play is an added incentive to check it out. Why not take the entire concept of Battle Royale and put it out to sea? Well, early access game Maelstrom does just that. 15 players compete to be the last ship floating on these fantasy waters, where mythical sea beasties roam ready to drag you under the moment you slip outside the safety of the circle. You’ll have to pick whether to play as an orc, a human or a dwarf, utilising their different ship types to your advantage against the other players. It’s a brilliant little game that looks amazing, it can occasionally be a bit tricky to find a match though as it’s not yet garnered the kind of audience that Fortnite boasts on an hourly basis. Although most Battle Royale games take their inspiration from the brilliant Japanese movie of the same name, The Culling actually takes its cues from another Japanese movie called… well… The Culling. It’s set in a jungle forest biome where 16 players are tasked with shooting, whacking, exploding or otherwise murdering each other. In the sky floats a gigantic leaderboard plotting the various demises and who’s still kicking about. It’s basically Hunger Games: The Video Game. Unlike other Battle Royale games, the emphasis here is in the smaller numbers and a variety of melee weapons, making sure the combat is close and blood-drenched. It’s also hilariously tongue-in-cheek with its comedy, a la Fortnite. Following on with the Hunger Games theme, SOS is another game that riffs on the idea of watching a load of people try and kill each other on a small island. In this game there are 16 players taking part in a fictional TV show where they’re stranded on an island full of monsters - and each other. But surviving is actually only half the game as, like in the real Hunger Games, you can win over the audience to give you an edge, and the more they like you, the more likely they are to drop helpful items or weapons in just for you. Interestingly, three players can make it out alive at the end of a 30-minute match, meaning there’s potential not only for team-ups but horrible betrayals too. But your actions in each match will build your reputation going forward, earning you labels like “generous loner” or “dangerous betrayer”. You have been warned. Minecraft has been doing Hunger Games/Battle Royale/Last Man Standing deathmatches for years, and there are still dozens of servers dedicated to such a mode on PC. Communities like Mineplex are the best for offering balanced and competitive rounds set in the wonderfully blocky Minecraft world. Seeing as destructibility and building are key selling points of Minecraft in general, it was only a matter of time until Battle Royale snuck in. Of course, the combat is never going to compare to the fluidity of Fortnite, but when it’s as adorable as Minecraft it’s always going to be great fun. And, it’s kid-friendly! Before PUBG and Fortnite came along, Rules of Survival was the go-to mobile Battle Royale game. And in some ways it still is. It was the first to drop on mobile unlike PUBG and Fortnite, it’s available on both Android and iOS. Up to 120 players can take part in each round, and you’ll have an arsenal of weapons and vehicles at your disposal (when you can find them). It’s free to play, works exceptionally well, it’s very easy to find a match to jump into thanks to its ridiculous popularity and is basically PUBG on mobile. Another PUBG/Fortnite clone on Android and iOS is Knives Out, which actually happens to be made by the same people as Rules of Survival. Turns out NetEase has quite the obsession with Battle Royale games. The tweak with this one is that the map is massive; much, much larger than the Fortnite alternative. And yet, despite its size, it works remarkably well on mobile thanks to its vehicles and fast-moving storm. The Darwin Project is another fight for survival, but this time around you’ve got to succeed both against other players and the freezing cold. Set in a frozen wilderness where you’re participating in a dystopian research project, The Darwin Project isn’t about following a shrinking circle. Instead, you’ve got to be a hunter. Follow footprints in the snow, find clues that point to player locations, and even view maps that occasionally reveal their hidey holes. If that sounds like your cup of Battle Royale brew, we’d recommend playing it on PC where it’s now free-to-play and has a lot more players ready to kill. Think of Surviv.io as a top down version of PUBG. You can literally play it in any browser (helloooo lunch break fun) and it’s amazingly responsive once you figure out what all the pixel drops mean. It’s surprisingly good fun, and although it lacks the personality of the other games on this list, it’s kind of adorable and one to have a play with if you’re new to the genre. One of the more recent releases on this list is Radical Heights, a brand new free-to-play Battle Royale game from the folks over at Boss Key, the brains behind Lawbreakers. Like Fortnite, it goes more down the colourful, silly road than more ‘traditional’ Battle Royale games. It helps that it’s an ‘80s-infused romp with a game show setting filled with prizes, cash, ziplines, trampolines, BMXs and a hell of a lot of neon. It’s deemed an “X-Treme” Early Access game though, so be prepared for a few bugs and quirks in amongst the hilarity. Currently available via Steam's Early Access programme, Realm Royale is doing the battle royale genre with its very own flavour. It's basically the game baby you'd get if you let Fortnite have a cheeky night with World of Warcraft, and it's kind of incredible. Technically, it's actually Paladins: Battle Royale with a new name, looks and overall feel, and it's this that makes it one to add to our list of games like Fortnite. It's got the same comic book-esque characters, a huge, brightly coloured map, and tiered loot to boot. But, it also has five different character classes to choose from, each with their own set of special abilities and stats that you'll need to work with throughout a match. But, wait, it gets better. If you get knocked down, you aren't left crawling around on the ground begging for a revive. Instead, you're turned into a chicken. A white-flag waving chicken that is capable of running right out of a fight and to safety, where, if you survive long enough, you'll be able to carry on in the match. That certainly puts a new spin on the Winner, Winner, Chicken Dinner concept, sorry PUBG. Are you ready for a heady dose of absolute silliness? If not, you should be because I'm about to recommend Totally Accurate Battlegrounds. It's technically not a game like Fortnite, it's more a game that takes the battle royale genre and parodies it within an inch of its life. This slapstick tactical battler features weird, floppy characters that run like they're made of jelly, which means there's a lot of falling down and generally worming around. Don't worry, there are still vehicles, armour, weapons, and an ever shrinking circle to fight in but TABG (lol) just does things a bit non-conventionally. Just a hint though, don't forget to hit G mid-battle. It's beatboxing time. This new addition comes from the developers of Titanfall 2, Respawn. But don’t expect to be piloting giant mechs or doing any wall-running in Apex Legends, as you play as one of eight Legends, each with their own special ability. Think Overwatch meets battle royale: these characters are as distinct as they get, with one that can call in an artillery strike and another that can send out a drone to heal allies. You play in groups of three, so there’s always someone to watch your back - but you don’t have to stick together if you don’t want to. The good news is if it’s just you and the people from your team left standing, you all win - no grizzly betrayal/fight to the death necessary.